A few months ago, my Windows laptop died on me. I was in pretty dire straights for a while until I decided to take the plunge and splurge on a Chromebook to call my very own. I'm actually pretty poor and had no money for what I considered at the time to be a "real" computer, so I opened a PayPal BillMeLater account and used it for a Toshiba Satellite CB35-A3120 13.3" Chromebook. In the time since then I've come to recognize it as a great choice in computers for absolutely anyone, and in this new series of posts I'm calling "Chromebooked" I'll give you all some tips and tricks for how to get the most out of your own Chromebook and, if you don't have one yet, show you why considering it isn't such a bad idea. Today I'm gonna get you started on the basics: how to deal with apps. 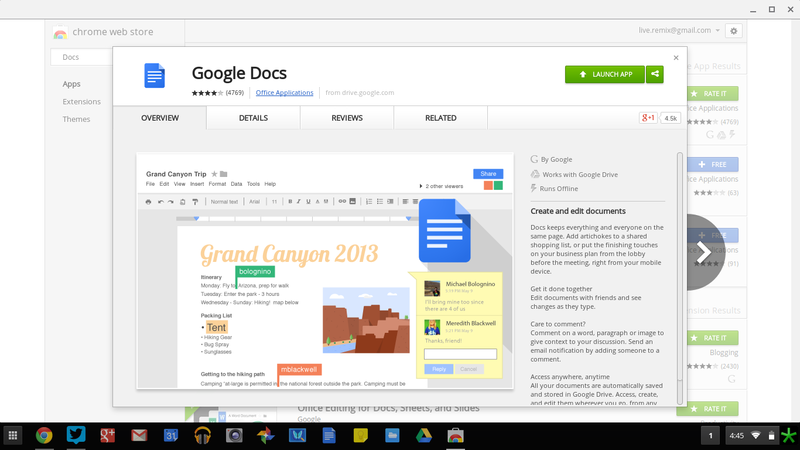 And we'll start off with the app that the Chromebook has going for it the most: Google Docs. 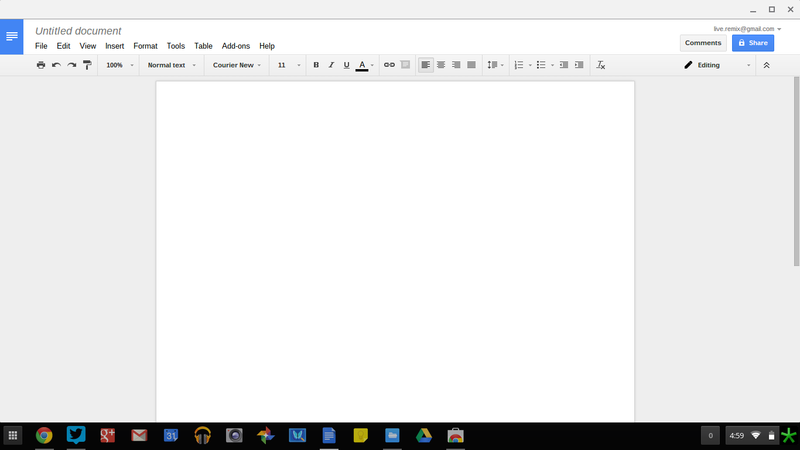 Now, Chromebooks usually come with Google Docs automatically, but for the sake of learning, I'll show you where you can get it and any other app you'll be using on the Chromebook. This is the Chrome Web Store. If you already use the Chrome browser, you might already be familiar with it. In fact, almost everything I'm going to show you today can already be done in the Chrome browser for Windows, Mac, or Linux, but Chromebook is where these things really shine. And the fact that they can be accessed on literally any other kind of computer is just part of what's so awesome about Chrome OS. Later, you can look through the Chrome Web Store and see all the wonderful apps it has available, but for now I'll type "Docs" into the search bar and get that. Here's an option that you won't find on any other operating system's app. 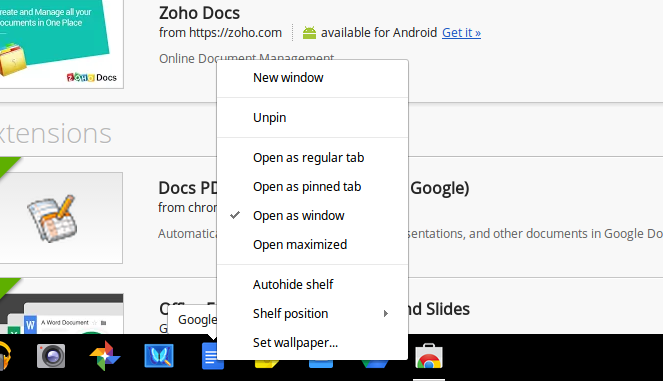 Because many of Chrome OS's apps are actually Web pages, you have the option to open them in a regular browser tab; in fact, that's the default option. But if you want an app to behave like an ordinary application (like Microsoft Word, for example), you can select "Open as window." What this will do is get rid of the browser interface and give the app a normal window border. It also works on the backend to completely isolate the app from the rest of the browser and make it its own entity, so if it somehow screws up, you can shut it down without worrying about the rest of your tabs or extensions. And here you have a blank, untitled document waiting to be written. You'll find in Google Docs that you can use it exactly like you would use Microsoft Word. A couple of its most recently added features include the ability to open native Word files and track changes using "Suggesting mode" which you can access on the top right where it says "Editing." As you add and use more apps, you'll discover for yourself whether you like those apps running in tabs or in windows. Personally, I like Docs to run in a window while things like Facebook I prefer to be in a tab, but it's really up to you. Except when it comes to packaged apps! Packaged apps are a whole different monster. Remember how I said that many of Chrome OS's apps are actually Web pages? Such is not the case with packaged apps. Instead of being built on the Web with the browser in mind, these apps are built like extensions that you actually download and they behave like programs on a Windows machine. 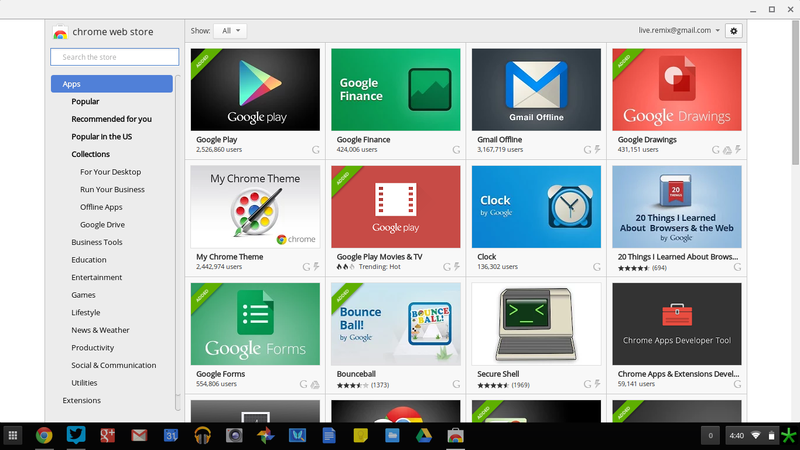 Go back to the Chrome Web Store and click the "For Your Desktop" Collections category and you'll see all the packaged apps that are available for Chrome. 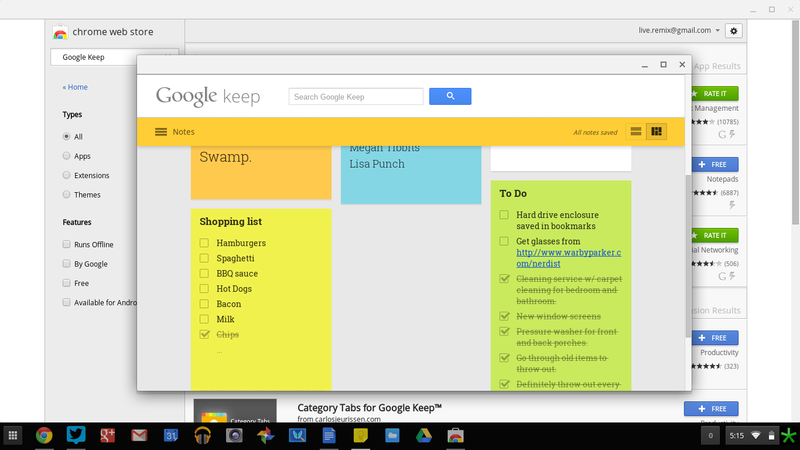 For now, I'm going to show you Google Keep. 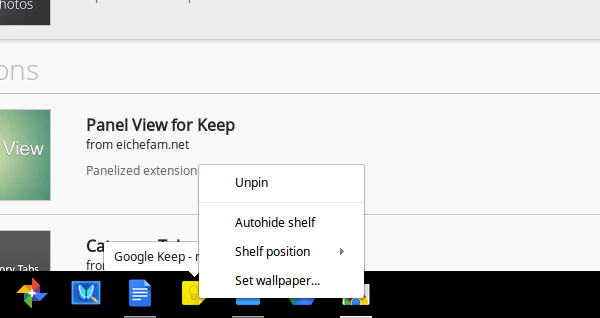 As you can see, there are no options for how to open Google Keep. This is because there's only one way to open packaged apps: in a window. Automatically dock! Now I can have my notes off to the side and reference them while I'm doing whatever else I'm doing in the rest of the screen space. Like right this very instant, I have my notes docked while I write this blog post. And, like I said, this can be done with any app that can get narrow enough and is in a window. Keep, Hangouts, even Netflix and Tweetdeck can squeeze up in there if ya like. 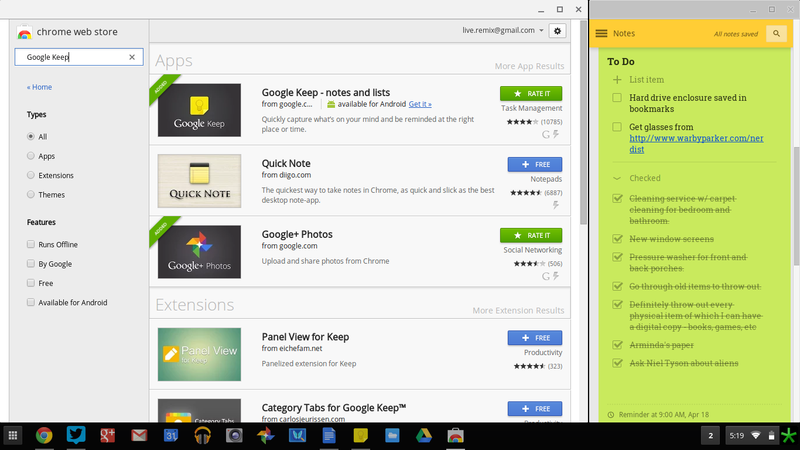 So, now you know what to do with apps on a Chromebook. There are plenty of resources out there to help you discover which apps can replace the programs you were using on Windows or Mac, and, in fact, I'll probably go through some of them in the future. But now you know what to do with them when you get them. If you already have a Chromebook, tell me what your favorite apps to use are. And if you haven't yet come around, tell me what apps run on your favored OS that you're scared of leaving behind. Next time I'll show you one of my favorite Web apps that can replace Photoshop. Until then, keep playing around!